The influence of groundwater on surface-water quality in the San Joaquin River, California, was examined for a 59-mile reach from the confluence with Salt Slough to Vernalis. 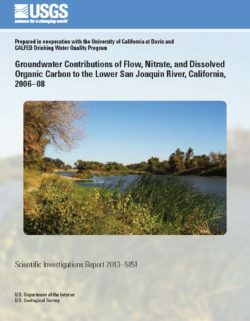 The primary objective of this study was to quantify the rate of groundwater discharged to the lower San Joaquin River and the contribution of nitrate and dissolved organic carbon concentrations to the river. Multiple lines of evidence from four independent approaches were used to characterize groundwater contributions of nitrogen and dissolved organic carbon. Monitoring wells (in-stream and bank wells), streambed synoptic surveys (stream water and shallow groundwater), longitudinal profile surveys by boat (continuous water-quality parameters in the stream), and modeling (MODFLOW and VS2DH) provided a combination of temporal, spatial, quantitative, and qualitative evidence of groundwater contributions to the river and the associated quality. Monitoring wells in nested clusters in the streambed (in-stream wells) and on both banks (bank wells) along the river were monitored monthly from September 2006 to January 2009. Nitrate concentrations in the bank wells ranged from less than detection—that is, less than 0.01 milligrams per liter (mg/L) as nitrogen (N)—to approximately 13 mg/L as N. Nitrate was not detected at 17 of 26 monitoring wells during the study period. Dissolved organic carbon concentrations among monitoring wells were highly variable, but they generally ranged from 1 to 4 mg/L. In a previous study, 14 bank wells were sampled once in 1988 following their original installation. With few exceptions, specific conductivity and nitrate concentrations measured in this study were virtually identical to those measured 20 years ago. Streambed synoptic measurements were made by using a temporarily installed drive-point piezometer at 113 distinct transects across the stream during 4 sampling events. Nitrate concentrations exceeded the detection limit of 0.01 mg/L as N in 5 percent of groundwater samples collected from the in-stream wells as part of the synoptic surveys. Only 7 of the 113 cross-sectional transects had nitrate concentrations greater than 1 mg/L as N.
In contrast, surface waters in the San Joaquin River tended to have nitrate concentrations in the 1–3 mg/L as N range. A zone of lower oxygen (less than 2 mg/L) in the streambed could limit nitrate contributions from regional groundwater flow because nitrate can be converted to nitrogen gas within this zone. Appreciable concentrations of ammonium (average concentration was 1.92 mg/L as N, and 95th percentile was 10.34 mg/L as N) in the shallow groundwater, believed to originate from anoxic mineralization of streambed sediments, could contribute nitrogen to the overlying stream as nitrate following in-stream nitrification, however. Dissolved organic carbon concentrations were highly variable in the shallow groundwater below the river (1 to 6 ft below streambed) and generally ranged between 1 and 5 mg/L, but had maximum concentrations in the 15–25 mg/L range. The longitudinal profile surveys were not particularly useful in identifying groundwater discharge areas. 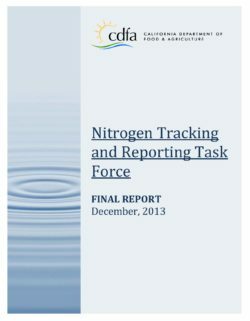 However, the longitudinal approach described in this report was useful as a baseline survey of measured water-quality parameters and for identifying tributary inflows that affect surface-water concentrations of nitrate. Results of the calibrated MODFLOW model indicated that the simulated groundwater discharge rate was approximately 1.0 cubic foot per second per mile (cfs/mi), and the predominant horizontal groundwater flow direction between the deep bank wells was westward beneath the river. The modeled (VS2DH) flux values (river gain versus river loss) were calculated for the irrigation and non-irrigation season, and these fluxes were an order of magnitude less than those from MODFLOW. During the irrigation season, the average river gain was 0.11 cfs/mi, and the average river loss was ?0.05 cfs/mi. During the non-irrigation season, the average river gain was 0.10 cfs/mi, and the average river loss was 0.08 cfs/mi. 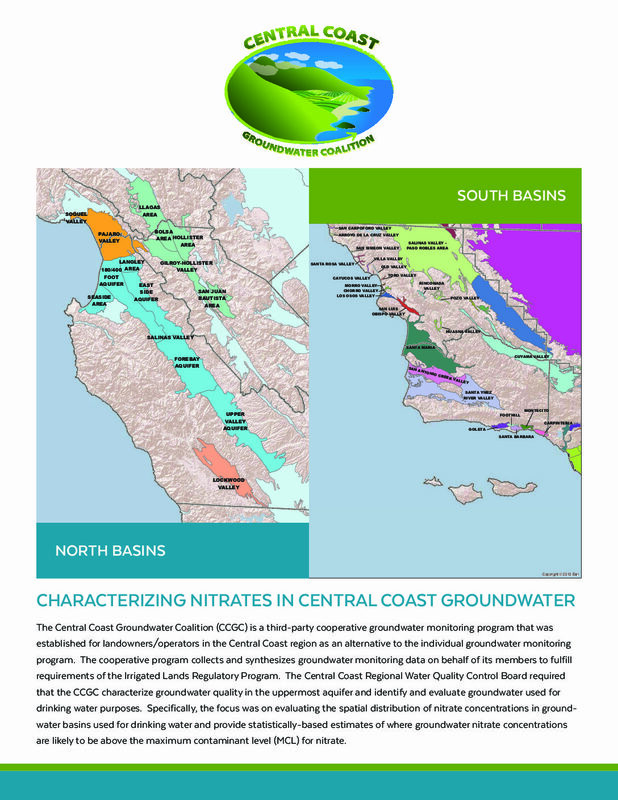 The South Coast Interior Basins (SCI) study unit covers approximately 653 square miles and consists of the Livermore, Gilroy-Hollister, Cuyama Valley, Castac Lake Valley, Cuddy Canyon Valley, Cuddy Ranch Area, Cuddy Valley, and Mil Potrero groundwater basins (California Department of Water Resources, 2003). These basins were grouped into three study areas based on geography: Livermore (LIV), Gilroy (GIL), and Cuyama (CUY) (Mathany and others, 2009). Average annual precipitation across the study unit varies among the three study areas—from more than 20 inches (in.) along the northwest margin of the LIV study area to less than 8 in. in the northern parts of the CUY study area. 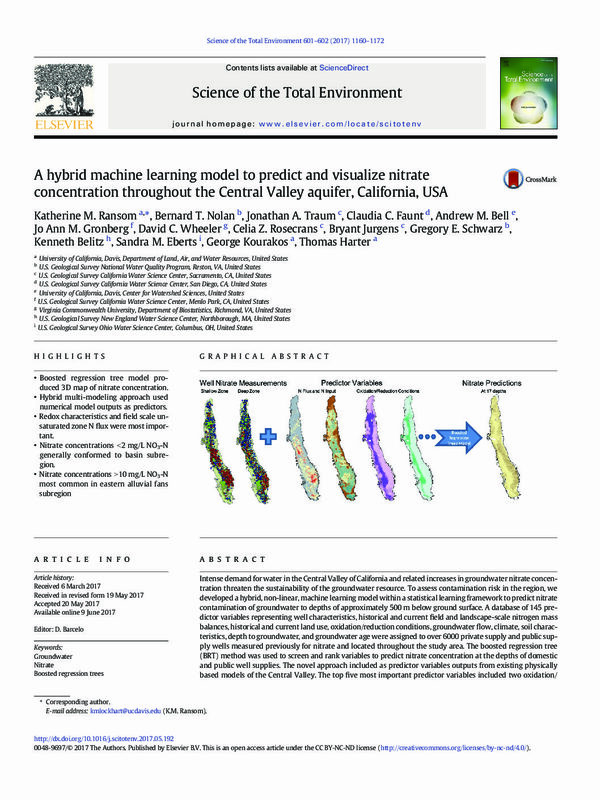 The study areas are drained by the Arroyo de la Laguna canal in LIV, the Pájaro River and the San Benito River in GIL, and the Cuyama River in CUY. The primary aquifer system consists of Plio-Pleistocene sedimentary formations, Tertiary to Holocene-age alluvial sedimentary sequences, and unconfined Holocene- age and Pleistoceneage alluvium. The primary aquifer system is defined as those parts of the aquifers corresponding to the perforated intervals of the public-supply wells listed in the California Department of Public Health (CDPH) database. Public-supply wells in the study unit are typically drilled to depths between 200 and 600 feet, consist of solid casing from the land surface to a depth of about 50 to 350 feet, and are perforated below the solid casing. Water quality in the primary aquifer system may differ from that in the shallower and deeper parts of the aquifer system. Land use within 500-meter buffer areas around the wells in the study unit is approximately 44 percent (%) agricultural, 29% urban, and 27% natural. Agricultural lands are mostly orchards, row crops, vineyards, or pastures. The largest urban areas are the cities of Livermore and Gilroy. 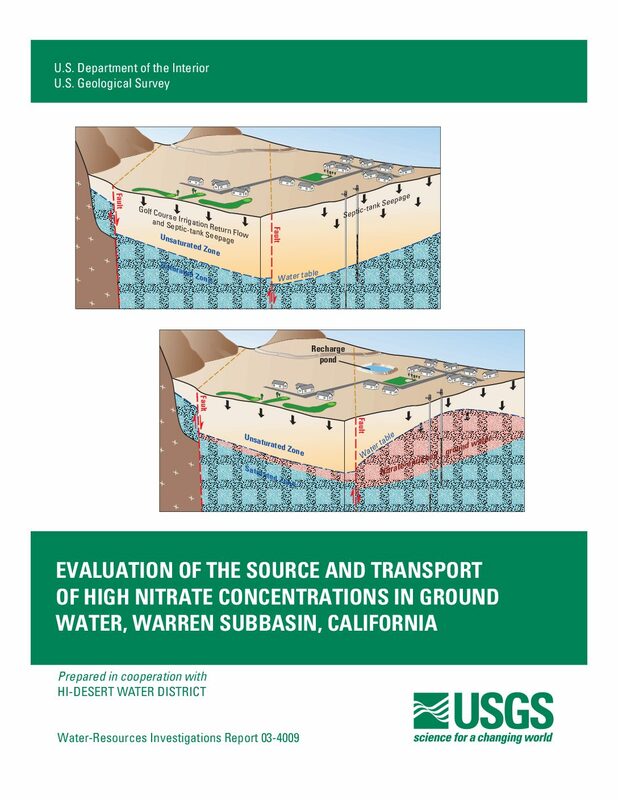 Recharge to groundwater basins occurs as infiltration of spring and streamflow, direct infiltration of precipitation and irrigation, subsurface inflow, and engineered recharge (percolation ponds and river regulation). The primary sources of groundwater discharge are water pumped for irrigation and municipal supply, discharge to rivers and streams, and evaporation. Groundwater provides more than 40 percent of California’s drinking water. 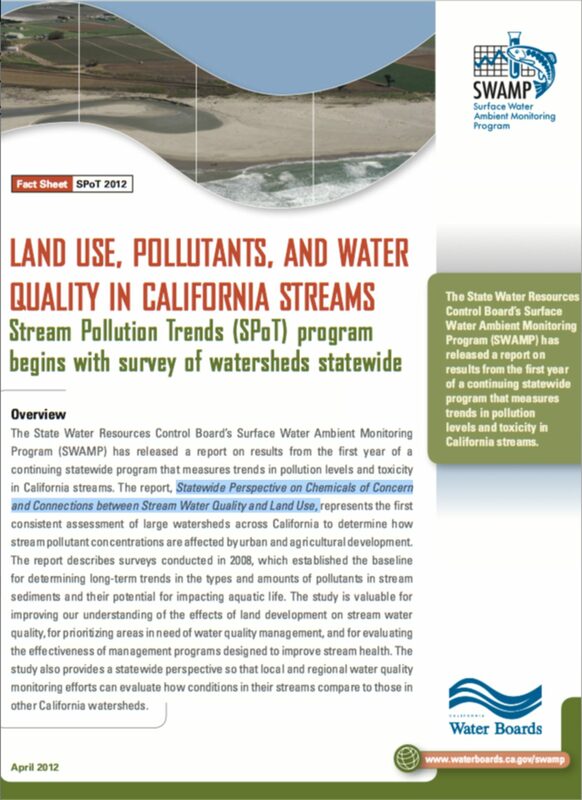 To protect this vital resource, the State of California created the Groundwater Ambient Monitoring and Assessment (GAMA) Program. 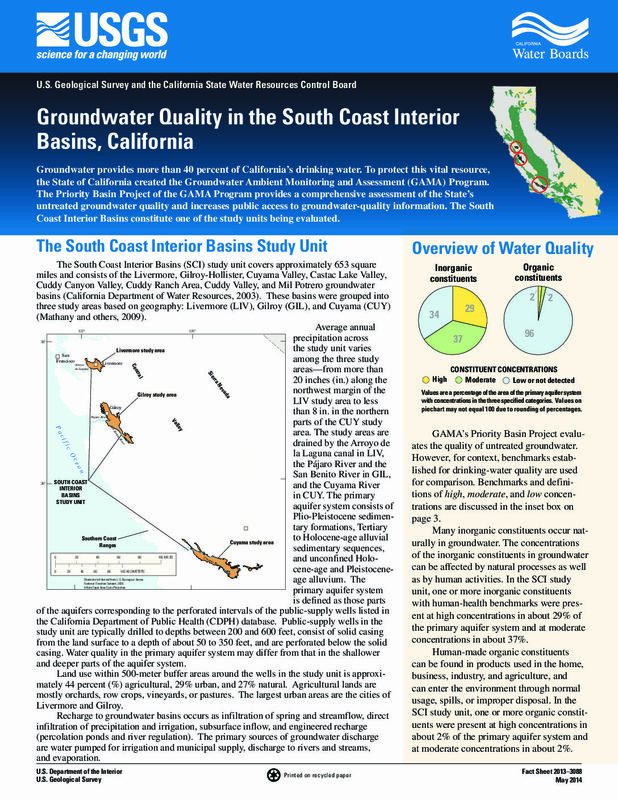 The Priority Basin Project of the GAMA Program provides a comprehensive assessment of the State’s groundwater quality and increases public access to groundwater-quality information. The Western San Joaquin Valley is one of the study units being evaluated. While most Californians take for granted that safe water is readily available at the turn of a tap, a growing number of communities, primarily in the San Joaquin Valley and other agricultural areas of the state, face very real impacts from nitrate contamination of the drinking water sources serving their homes and schools. New research led by the Pacific Institute, The Human Costs of Nitrate-Contaminated Drinking Water in the San Joaquin Valley, finds that nitrate contamination of groundwater has wide-reaching effects on California’s health, economic vitality, and environmental well being, disproportionately affecting low-income households and Spanish-speaking residents. 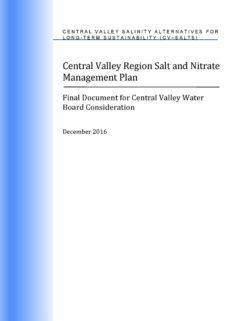 The analysis brings a stark reality check to the fore as the Central Valley Water Board considers a new regulatory program for irrigated lands, the primary source of nitrate contamination in the San Joaquin Valley. There have never been any regulatory requirements on irrigated agriculture to protect groundwater from fertilizers, which are the primary source of nitrate in the valley. Nitrate levels have increased dramatically in drinking water supplies over the last few decades. 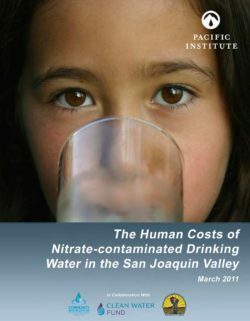 The new study, The Human Costs of Nitrate-Contaminated Drinking Water in the San Joaquin Valley, a collaboration of the Pacific Institute, Community Water Center, Clean Water Fund, and California Rural Legal Assistance Foundation, focuses on the household costs of avoiding nitrate-contaminated drinking water connected to community water systems and the costs to these systems of removing or avoiding nitrates, and it points to key policies and further research needed to better understand and resolve this entrenched challenge. 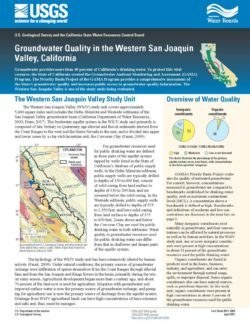 The eight-county San Joaquin Valley has some of the most contaminated aquifers in the nation: 92 drinking water systems in the San Joaquin Valley had a well with nitrate levels above the legal limit from 2005-2008, potentially affecting the water quality of approximately 1.3 million residents. In addition to public water systems, the State Water Board sampled 181 domestic wells in Tulare County in 2006 and found that 40% of those tested had nitrate levels above the legal limit.